Would you like to erase years of stain and discoloration from your teeth? Would you like to revitalize your smile, look younger and feel better? At Dentistry With TLC we are committed to offering you the very best whitening systems. Most dentists only offer one whitening system, but we offer five different systems to help you reach the results you desire. Let's start with the best, Lumineers. Lumineers - is a very thin porcelain that is bonded to your teeth to create a straight and white smile. Lumineers are a permanent whitening solution, and you will never have to whiten again. Getting Lumineers is a fast and painless procedure. The process only requires two visits, and doesn’t require any drilling, tooth reduction, or shots. Due to the strength and thinness of Lumineers, they can be bonded directly over your existing teeth to create a new, beautiful smile without any discomfort. Lumineers have been proven to last over 20 years, and do not age or change color like natural teeth. You may have your smile designed at our office. Simply make an appointment for your consultation. Deep Bleaching - No other whitening system can get your natural teeth whiter. This is the very best whitening system for changing the color of your natural teeth. At your first visit we will make plastic molds that fit over your teeth and hold bleaching agent close to your teeth. These are called bleaching trays. You will wear these trays while we activate the agent with a special light. This process takes about two hours in our office and causes absolutely no pain. You can watch a movie of your choice while you're bleaching so you don't get bored. Then you will take the trays home, place bleaching agent in them and wear them each night for two weeks. After the two week period then you will have one more bleaching session in our office with the special light. The results from this system can be astounding. 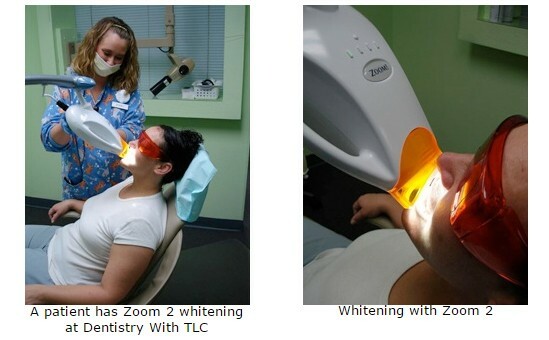 Zoom2 - This whitening system has become very popular by makeover shows like Extreme Makeover. It was developed by Dr. Dorfman in Beverly Hills. It takes only a couple of hours in our office. You can watch a movie of your choice while we place bleaching agent on your teeth and shine a light on your teeth. Results vary with this system. Some patients have great results and some patients see very little results. If your teeth tend to be sensitive to cold drinks or foods it seems that Zoom 2 can aggravate that response. Many people with sensitive teeth report some discomfort after the procedure. If you are expecting dramatic results this is not the best system for your investment. If you want to brighten your smile and not spend much time on the process, then Zoom 2 may be what you're looking for. Whitening for Life - This is a program we offer to all of our patients. We want Dentistry With TLC patients to have bright, beautiful teeth forever. You represent us and we want you to look your best. Therefore, after you complete your recommended cleaning/gum treatments we will make you bleaching trays. When you come to each of your 6-month cleaning appointments we will give you a tube of bleaching gel absolutely free. You can get free bleaching gel for the rest of your life! This system was created to help patients keep their teeth from staining and looking old. It is not meant to give dramatic results. It is meant to work about as well if not better than anything you can buy at the drugstore to whiten your teeth. TresWhite - This is an at-home whitening program. This is a professional strength whitening system that usually has better results than over-the-counter systems. Its advantage is that we do not have to make molds or impressions of your teeth. You simply take home 20 pre-made whitening trays and use them at your convenience to brighten you smile. I saw someone have ZOOM2 whitening on Extreme Makeover. Are there any local dentists that do ZOOM2? I want to whiten my teeth. However, I have very sensitive teeth. I've done some research and learned that Deep Bleaching is the best type of whitening for sensitive teeth. Where can I get Deep Bleaching? I'm ready to have a smile makeover. Are there any local dentists that have experience with cosmetic dentistry and hold a membership in the American Academy of Cosmetic Dentistry? Is there any way to whiten my teeth and not have them turn dark again? Lumineers are very thin pieces of porcelain that are bonded to your teeth to create a straight and white smile. Lumineers are a permanent whitening solution, and you will never have to whiten again. Getting Lumineers is a fast and easy procedure. The process only requires two visits, and doesn’t require any drilling, tooth reduction, or shots. Due to the strength and thinness of Lumineers, they can be bonded directly over your existing teeth to create a new, beautiful smile without any discomfort. Lumineers have been proven to last over 20 years, and do not age or change color like natural teeth. You may have your smile designed at our office. You can have a digital smile makeover picture created at our office to help you see how you will look with Lumineers. Dr. Smith has many years of experience with designing and placing Lumineers. Her husband, father and close friends have Lumineers. At your consultation appointment you will be able to meet Dentistry With TLC employees who have Lumineers. The most common type of veneer recommended by Dr. Smith is called a Lumineer. She has many years of experience designing and placing Lumineers. Her husband, father, and friends have had her design and place their Lumineers. There are other types of veneers. Dr. Smith will explain the different types and the pros and cons of each at your consultation appointment. With many financial options available at Dentistry With TLC, why wait? Call today to speak to a financial advisor more information.